Everything is unique, but some things are more unique than others. Tonight is another unparalleled night on Connaught Rd Central, with the companionship of my dear classmates and one of our university professors. It rained for a while half an hour ago, though we were not prepared for the sudden change in weather. Fortunately, as soon as it started raining, one of the first-aiders nearby lent us a tent (thank you so much for his generosity). As I am writing these words, under the yellowish streetlamp, they are gathering around inside the tent, talking on whatever topics come to mind, and reluctant to sleep. Yes, I am reluctant to sleep. Insomnia has been haunting me these days. Maybe it is also haunting most of us. The roughness of the uncomfortable cement ground is doubtlessly one of the reasons causing the condition; whilst what concerns me more greatly is the sense of uncertainty towards the future. The future of me, the future of us, and the future of this place I call home. Where are we heading to? Since THAT UNIQUE DAY, 28th September, everything seems to be changing at an ever-accelerating pace. The beliefs I have been upholding are falling apart. 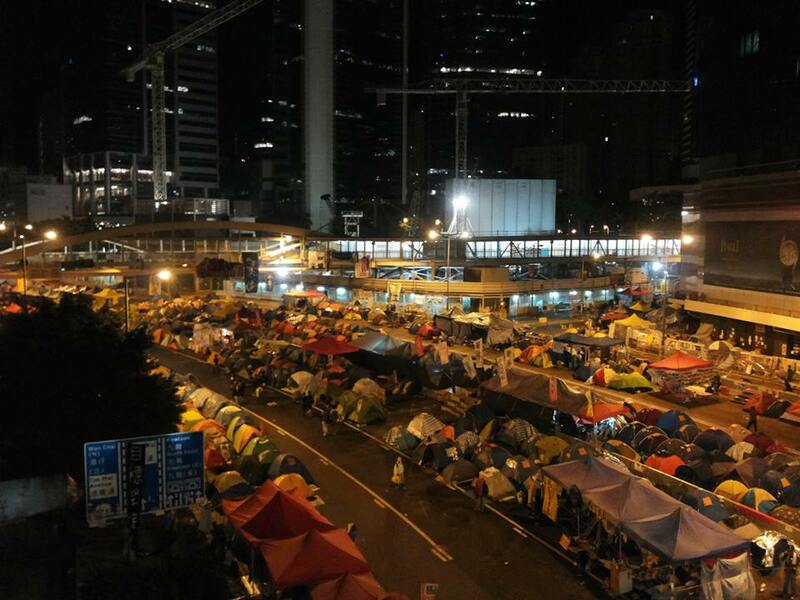 What I am talking about is the ever-worsening political crisis in Hong Kong. Maybe I should write it down here to remind myself, and for generations to come. This place, Hong Kong, has “enjoyed” the status of a Special Administrative Region of the PRC since the 1997 handover. According to the Sino-British Joint Declaration in 1984, the PRC promised a “grace period” of fifty years during which the city’s high degree of autonomy would be respected and guaranteed. It is called the “one country, two systems” principle, and theoretically, the Chinese Communist Party has no right to interrupt Hong Kong’s development as a capitalist metropolis. However, an ideal is only an ideal, an ideal cannot escape from suffering distortion in practice. Hong Kong is losing its privileged status as a liberal city. In different ways, the PRC attempted to undermine our identity and autonomy. For example, in 2012 the government planned to implement the patriotic National Education curriculum in primary and secondary schools; this decision triggered the gathering of around 8000 citizens at the Legislative Council to reject the government’s plan. On a related note, also to do with the education of students in Hong Kong, recently, there are rising concerns about the government’s intention to advocate using Mandarin as the medium to teach Chinese lessons instead of Cantonese. The threat of the Party is here, is now. So that’s why I am here, sitting on the Connaught Rd Central, with numerous other HongKongers.